Red Cliff (赤壁), alternatively known as The Battle of Red Cliff, is a two-episode Chinese epic film based on the Battle of Red Cliffs and events during the Three Kingdoms period in Ancient China. The first episode is expected to be released in 2008. The film is directed by John Woo and stars Tony Leung Chiu-Wai, Takeshi Kaneshiro, Zhang Fengyi, Chang Chen, Hu Jun, Lin Chi-ling and Zhao Wei. 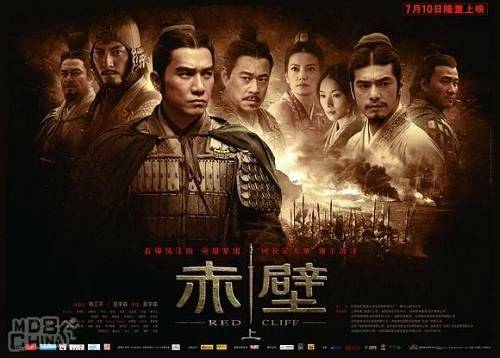 With an estimated budget of US$80 million,The Battle of Red Cliff is the most expensive Asian-financed film to date. According to Han Sanping, veteran producer and the CEO of China Film Group, one of the chief investors in the film, The Battle of Red Cliff currently has too much material to include in a single feature. It will therefore be divided into two episodes, with the first to be released before the 2008 Summer Olympics, and the second only at the end of 2008. Producer Terence Chang confirmed this, saying that the Chinese government views the film as a showcase of Chinese history and wants it released before the Olympic Games. This film is one of the two 2008 Three Kingdoms related films, the other being Daniel Lee's Three Kingdoms: Resurrection of the Dragon which has already been released. Director John Woo said in an interview with CCTV-6 that the film will use primarily the historical record Chronicle of the Three Kingdoms as a blueprint for the Battle of Red Cliffs, rather than the historical novel Romance of the Three Kingdoms. As such, traditionally vilified characters such as Cao Cao and Zhou Yu will be given a more historically accurate treatment in the film. 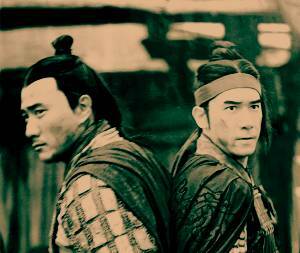 Tony Leung Chiu-Wai was originally selected for the role of Zhuge Liang. However, he rejected the role, citing the lack of time (after filming Lust, Caution) to learn his lines, which are in Mandarin.Producer Terence Chang said financial backing is not affected by the change. Ken Watanabe was originally selected for the role of Cao Cao. According to a report, some Chinese fans voiced objections over the choice as they felt that it was inappropriate for a Japanese actor to play the role of a Chinese historical figure. The report claimed that the protests influenced the decision of director John Woo, who eventually chose Zhang Fengyi for the role. Chow Yun-Fat was originally selected for the role of Zhou Yu, and had even earlier been considered for the role of Liu Bei. However, he pulled out on 13 April 2007, just as shooting began. Chow explained that he received a revised script a week earlier and was not given sufficient time to prepare, but producer Terence Chang disputed this, saying that he could not work with Chow because the film's Hollywood insurer opposed 73 clauses in Chow's contract. Chow was replaced by Tony Leung Chiu-Wai, who had previously turned down the role of Zhuge Liang.However, there are rumours that Chow may be guest starring in the movie. 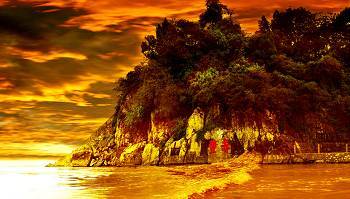 Production is helmed by Lion Rock Entertainment and China Film Group. Distributors are fast to clinch the deal before shooting even began. Current confirmed distributors include Chengtian Entertainment (Mainland China), Avex Entertainment (Japan), Showbox (South Korea), and the Los Angeles-based Summit Entertainment (international). 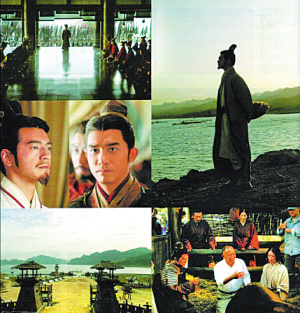 Shooting of The Battle of Red Cliff was slated to begin 29 March 2007, but was later postponed to mid-April. Shooting will be held at a film studio in Beijing, as well as in Hebei province, where naval warfares will be staged at two working reservoirs. The art director Timmy Yip told the Associated Press that the film's production design posed a big challenge because of its enormous scale, but said that he had resolved most of his problems, which included funding and location issues. According to producer Terence Chang, shooting is to follow the "Hollywood model", with the cast given breaks over the weekends. Shooting is also expected to be wrapped up in September. According to a report, all cast members had received instruction to report 6 April 2007 at a training ground in the suburbs of Beijing for pre-shoot preparations. Chow Yun-Fat and Takeshi Kaneshiro, who have had experiences in period films, are busy going over the script; while Hu Jun, Zhang Fengyi, You Yong and Chang Chen are undergoing training in Chinese martial arts and equestrianism. According to other reports, Lin Chi-ling, who will play Younger Qiao in the movie, has already been undergoing training in Beijing in preparation for her role. Japanese actor and actress Nakamura Shido and Koyuki have joined the cast, Nakamura playing the Wu general Gan Ning and Koyuki's role has not yet been determined. Currently (May 2008) John Woo and his post production crew are finalising the edit and sound mix at Soundfirm Sydney, Australia. 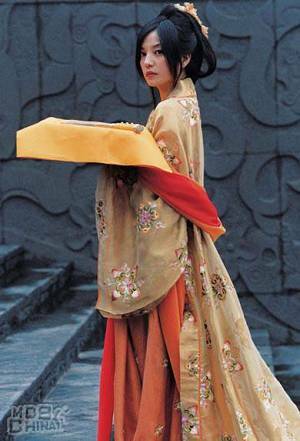 The second Red Cliff film will be mixed by Soundfirm in Australia later in 2008. The theme song 'Xin Zhan' (心战) is sung by alan, a Japan-based Chinese singer of Tibetan descent who's under contract with Avex Entertainment, one of the film's distributors. On June 9, 2008, a stuntman doing shots for the movie was killed in a freak fire accident,which also left six others injured.